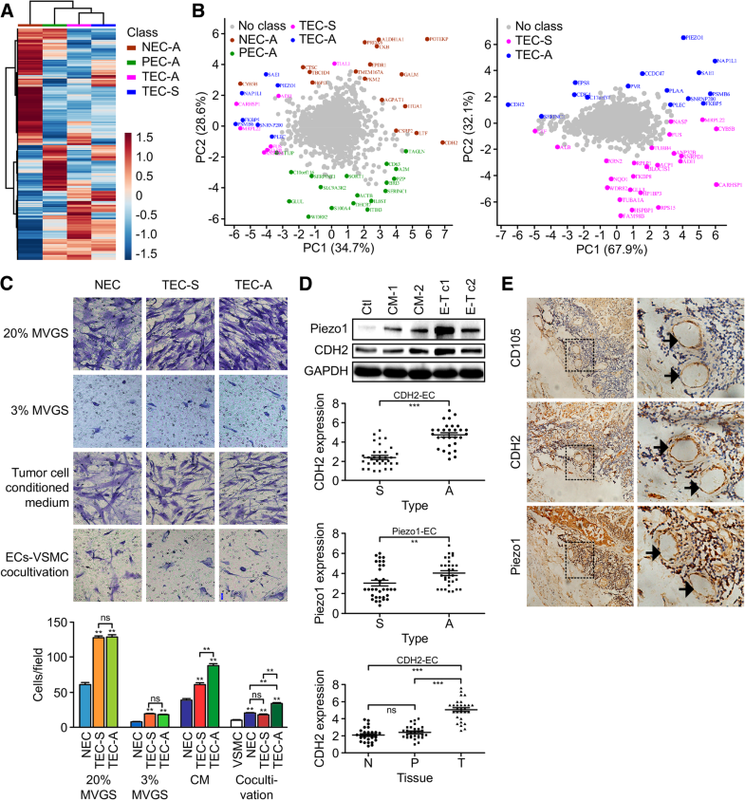 In lung cancer, antiangiogenic strategies targeting tumor-derived endothelial cells (TECs) afford a survival advantage, but the characteristics of TECs have not been comprehensively elucidated. Herein, high-purity (> 98%) TECs were obtained, and these cells retained expression of EC markers and exhibited high viability. ITRAQ-2DLC-MS/MS was performed to profile the proteome and the heterogeneity of ECs. Only 31 of 1820 identified proteins were differentially expressed between adenocarcinoma (ADC)- and squamous cell carcinoma (SCC)-derived TECs (TEC-A and TEC-S, respectively), and cadherin-2 (CDH2) was the most significantly upregulated protein in TEC-A samples. Positive immunostaining for CDH2 (score > 3) was significantly more frequent in the endothelium of ADC tissues than in that of SCC tissues. Loss- or gain-of-function analysis showed that CDH2 significantly promoted in vitro and in vivo angiogenesis and sensitivity to the antagonist exherin. The MAPK/ERK and MAPK/JNK signaling pathways may play crucial roles in CDH2-induced HIF-1α/VEGF-mediated angiogenesis. Moreover, high CDH2 expression in TECs was significantly associated with tumor stage, visceral pleural metastasis, and decreased overall survival in patients with ADC but not SCC. Together, these data indicate the importance of CDH2 in angiogenesis and highlight its potential both for antiangiogenic therapy and as a candidate prognostic marker for ADC. Lung cancer (LC) has long been considered the leading cause of cancer-related deaths worldwide . Many new antiangiogenic strategies (mainly focusing on tumor-derived endothelial cells (TECs)) have been developed, resulting in improved progression-free survival . Therefore, it is necessary to comprehensively elucidate the characteristics of TECs to improve the success of antiangiogenic strategies for LC. Non-small cell lung carcinoma (NSCLC) mostly comprises squamous cell carcinoma (SCC, ~ 28%) and adenocarcinoma (ADC, ~ 48%), which have distinct clinical characteristics, histological presentations, proteomic profiles, metabolic phenotypes, immune cell signatures and gene expression subtypes [3–5]. For example, ADC commonly expresses the type II pneumocyte markers SP-C and TIF1; in contrast, SCC preferentially expresses the basal cell markers Trp63 and Krt5/14 . In addition, the expression of glucose transporter GLUT1, is significantly elevated in SCC . The clinical efficacy of currently approved antiangiogenic therapies (i.e., the anti-VEGF inhibitor bevacizumab and the anti-VEGF receptor 2 [VEGFR2] inhibitor ramucirumab) differs between SCC and ADC . However, only a few strategies have been employed to focus on LC-derived TECs because of analytical limitations [7, 8], and reports on the heterogeneity of TECs are rare. To our knowledge, large-scale proteomics analysis of ECs in lung ADC, ADC-related TEC-selective proteins, or the heterogeneity of TECs between the ADC and SCC subtypes has not yet been reported. Therefore, we focused on the mechanism of the most important proteins responsible for heterogeneity to facilitate the development of potential therapeutic strategies. Primary ECs that were positive for expression of EC markers (CD31, CD34, CD144, CD105, and VWF) but negative for expression of a vascular smooth muscle cell (VSMC) marker (α-SMA) and monocyte markers (CD11b and CD45b), with high purity and viability (CD105 expression > 98%, AcLDL uptake > 90%), were prepared (Fig. 1; Additional file 1). A total of 1820 proteins were identified. Gene set enrichment analysis of the differentially expressed proteins among ADC-related ECs shown in Additional file 2: Figure S1, including the 81 proteins unique to TECs from ADC (TEC-A) (compared to paratumor-derived ECs from ADC (PEC-A) and normal tissue-derived ECs (NEC-A)), which were mainly involved in transcription activity, protein prepare, hydrogen peroxide catabolic processes, NF-κB transcription factor activity. The proteomic profiles were similar in TECs by heatmap analysis (Fig. 2a). A few principal components accounted for 63.3% (PC1 and PC2) of the total data variation, and the locations of the TECs were very close together. Then, the TEC proteomic profiles were analyzed in pairs (Fig. 2b). The results show the proteins (including CDH2, Piezo1, EPS8, NAP1L1, FAM98B, HSPBP1, RPS15 and so on) responsible for segregation into two groups. Only 31 proteins (see Additional file 3: Table S1) were differentially expressed in both groups, among which CDH2 and Piezo1 were the two most significantly upregulated proteins in the TEC-A group. The expression levels of 15 significantly altered proteins were verified by western blotting (Additional file 4: Figure S2A). Similar changes were observed in PEC-A, TEC-A and tumor cell–EC cocultivation samples. Therefore, all types of isolated ECs provide a good basis for studying tumor angiogenesis and heterogeneity. EC migration and positive regulation of smooth muscle cells are two important biological processes relevant to angiogenesis. The migration of TECs induced by either M131 medium containing 20% or 3% MVGS or tumor cell-conditioned medium (CM) was significantly faster than that of NECs (pool of NEC-A and NEC-S), but TEC-A migration was even faster (P < 0.01) than that of TEC-S in the CM group. Moreover, during EC- VSMC cocultivation, although all types of ECs enhanced the migration of VSMCs, TEC-A did so most markedly (Fig. 2c). The expression levels of Piezo1 and CDH2 were upregulated in primary human umbilical vein endothelial cells (HUVECs) cocultured with the lung ADC cell line SPC-A-1 but not the SCC cell line L-78 or CM from SPC-A-1 or L-78 cells (Fig. 2d). Positive immunostaining of Piezo1 and CDH2 (score > 3) was significantly more frequent in TEC-A than in TEC-S samples (P = 0.01 and P < 0.0001, respectively; Fig. 2e). In SCC, the expression of CDH2 was much higher in TECs than in NECs or PECs. Furthermore, the prognostic values revealed that high tumor CDH2 expression was related to a shorter survival time in LC patients (P = 0.017); this correlation was more significant in ADC (n = 720, P = 0.008) but not significant in SCC (n = 524, P = 0.220). However, no similar correlation between Piezo1 expression and survival time was observed (Additional file 4: Figure S2B). These data indicated that CDH2 likely plays more important functional roles in ADC development than in SCC development. Loss- or gain-of-function analysis revealed that CDH2 expression significantly promoted EC proliferation, motility and capillary-like tube formation, whereas silencing endogenous CDH2 had the opposite effect (Additional file 5: Figure S3). A markedly increased density of neovessels (VWF-positive) was observed in Matrigel plugs containing CDH2-overexpressing ECs (Additional file 6: Figure S4A). Preclinical and clinical data have shown that a peptidic CDH2 antagonist (exherin, ADH-1) causes rapid tumor vascular disruption and apoptosis . To date, limited research has been conducted on CDH2-expressing ECs. When treated with 0.4 mg/mL ADH-1 for 24 h, the CDH2 overexpression group (mainly located in the cell membrane) was significantly inhibited, but this effect was not obvious in the control group. ADH-1 induced apoptosis in a dose- and CDH2-dependent manner in ECs (Additional file 6: Figure S4B&C). With CDH2 overexpression, epithelial cell markers (E-cadherin, EpCAM, and P-cadherin), neural and basal cell adhesion molecules (NCAM-1, NrCAM, and BCAM), leukocyte rolling and attachment molecules (L-, E-, and P-selectin), and strictly EC-specific adhesion molecules (VE-cadherin) were all downregulated. Moreover, proteins known to positively regulate leukocyte migration (RANTES, ENA-78, IL-6, MCP-2, and IP-1α) were also significantly downregulated. Three proteins involved in the VEGFR signaling pathway (VEGFA, VEGFD, and VEGFR3) were significantly upregulated. Furthermore, the phosphorylation levels of two major MAPK signaling pathways, namely, the extracellular signal-regulated kinase (ERK) and c-Jun N-terminal kinase (JNK) pathways, were significantly increased, and CDH2 was confirmed to induce HIF-1α, VEGF, and VEGFR3 accumulation (Additional file 7: Figure S5). Therefore, the MAPK/ERK and MAPK/JNK signaling pathways are likely to play crucial roles in CDH2-induced HIF-1α/VEGF-mediated angiogenesis. 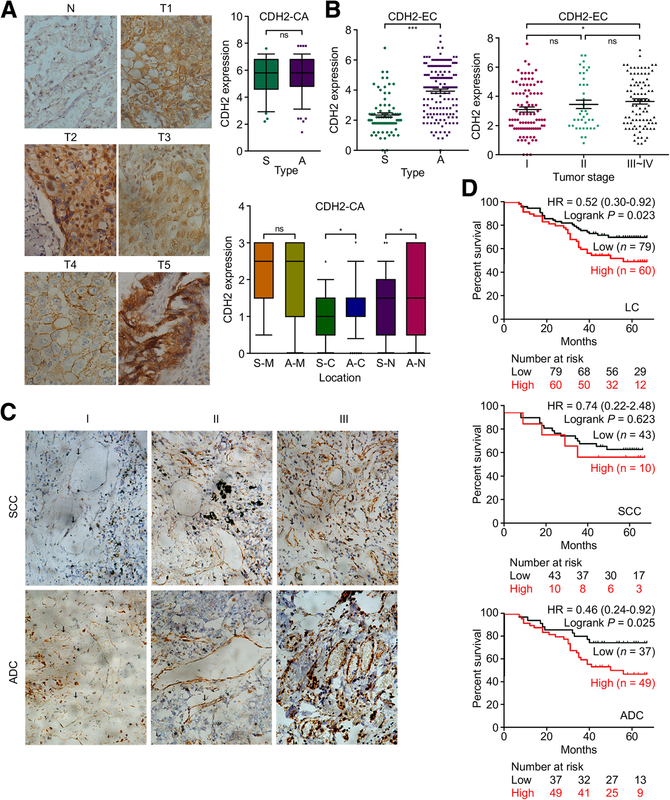 The adjacent normal tissues were nearly negative for CDH2 expression, but tumor cells in the lung tissues exhibited very strong positive staining (Fig. 3a, clinical data were listed in Additional file 8: Table S2). The expression of CDH2 in cancer cells from SCC and ADC did not differ significantly (scored by PP × IS), but its localization in cancer cells was heterogeneous. Therefore, expression was further rescored by the intensity of staining (IS, score: 0~3) in the membrane, cytoplasm and nucleus. CDH2 expression in the cytoplasm or nucleus was significantly higher in cancer cells form ADC than in those from SCC (P < 0.05). Heterogeneity of CDH2 cleavage resulted in different regulatory behaviors related to cancer cell–cell adhesion and cell migration/ proliferation . Positive CDH2 staining (score > 3) was seen in 22 and 66% of TECs from SCC and ADC tumors, respectively (Fig. 3b). High CDH2 expression in TECs was significantly positively related to ADC (P < 0.001) and tumor stage (P < 0.05) in LC patients, and positively related to tumor stage and visceral pleural metastasis in the ADC subtype (P < 0.05, Fig. 3b and c; Additional file 9: Table S3). Significantly poorer prognosis and overall survival were associated with patients with high TEC CDH2 expression and LC (P = 0.023) or ADC (n = 86, P = 0.025) but not SCC (n = 53, P = 0.623) (Fig. 3d). These data suggest that CDH2 may serve as a prognostic indicator of relative risk for patients with ADC. The proteomic profile of ADC-derived ECs was elucidated, and CDH2, which was uniquely upregulated in TEC-A, was proved to promote in vitro and in vivo angiogenesis and sensitivity to the antagonist ADH-1. The MAPK/ERK and MAPK/JNK signaling pathways may play crucial roles in CDH2-induced HIF-1α/VEGF-mediated angiogenesis. Strong CDH2 expression was significantly more frequent in TECs, and this expression pattern was associated with tumor stage, visceral pleural metastasis, and decreased overall survival in patients with ADC but not SCC. These data indicated the important role of CDH2 in angiogenesis, as well as its potential as both a new molecular target in combination with currently approved anti-angiogenic strategies and a candidate prognostic marker for ADC. This work was supported, in part, by grants from the National Natural Scientific Foundation of China (grant number 81370048), the Natural Science Foundation of Fujian Province (grant numbers 2016 J01631, 2016-ZQN-88, 2016 J01618 and 2017 J01380), and the Projects for Technology Plan of Xiamen in China (grant number 3502Z20174076). All data from our study are available upon request. HZ conceived of the study, drafted the manuscript and carried out the proteome studies. YZ carried out the preparation of clinical samples and participated in the immunoassays. XC carried out the cell biology studies and immunoassays. MX carried out the animal experiments and participated in the molecular genetic studies. LW performed the statistical analysis and participated in the preparation of clinical samples. LL carried out the cell biology studies and participated in the immunoassays. ZL participated in the proteomic analysis. XH participated in its design and revise. JC participated in its design, revise and coordination. All authors read and approved the final manuscript. All aspects of this study were approved by the medical ethics committee of The Affiliated Zhongshan Hospital of Xiamen University. All tissues used in the study were requested following approval by the Institutional Review Board of the Tumor Tissue Bank of Zhongshan Hospital, Xiamen University. Written informed consent was obtained from all enrolled patients, and all relevant investigations were performed according to the principles of the Declaration of Helsinki. All animal studies were performed with approval from the Xiamen University Laboratory Animal Center. Consent to publish has been obtained from all authors.